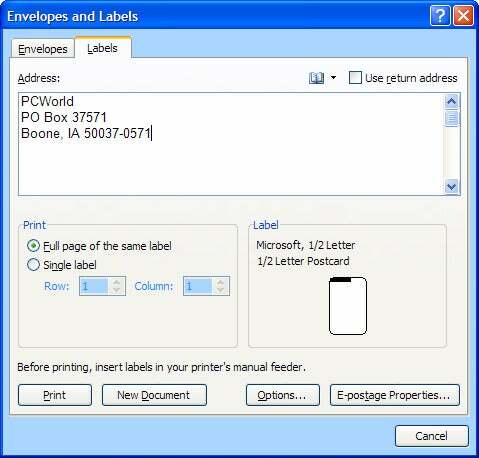 A relatively unpublicized feature in Word 2007 and 2010 lets you print labels using built-in templates that are suitable for just about any sheet of labels you can buy. With the templates, you can create and print individual labels on a sheet while leaving others blank, or you can print every label on the entire sheet. 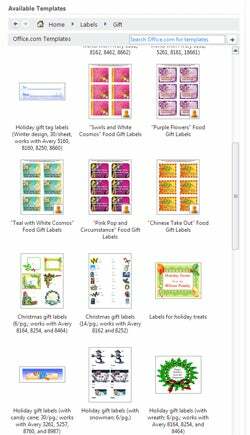 Templates are available for return address labels, shipping labels, business cards, post cards, gift tags, CD and DVD labels, and many other types of projects. 1. To use the built-in templates, click the Mailings tab. In the Create subsection on the left-hand side of the ribbon, click Labels to bring up the 'Envelopes and Labels' window. Paste or enter an address in the address window, or click the small address-book icon to choose an addressee from your contacts list in Outlook. Skip this step if you are not printing an address label. 2. In the Print section on the left, click either Full page of the same label or Single label. If you choose the latter option, select the column and row of the label you wish to print. You would use this option when, for example, you wanted to print an address on a single blank label on a sheet of 30 labels. The dialog box suggests inserting the label sheet into your printer's manual-feed tray. 3. Click Options, and then click the down arrow next to the Label vendors: field. (The default choice is 'Microsoft'.) Choose the brand of labels you want to use. You'll find a list of many vendors, including Avery and Office Depot. Scroll through the list under Product number to select the exact labels you have. Click OK.
4. Whether you're printing an entire sheet or a single label, you are now ready to print. If you wish to print several single labels on a sheet, repeat this process, selecting the 'Single label' option each time. 5. If Word doesn't have a built-in template for your labels or if you want to use someone else's design, you may be able to find a suitable free downloadable template from the Microsoft community. Click the File tab or Office button, and click New to create a new document. Under 'Office.com templates', click Labels. You'll see folders for various types of projects. Click on a folder and browse through the available choices. If you like one, click it to download it. Community templates are especially useful for projects such as gift tags. 1. 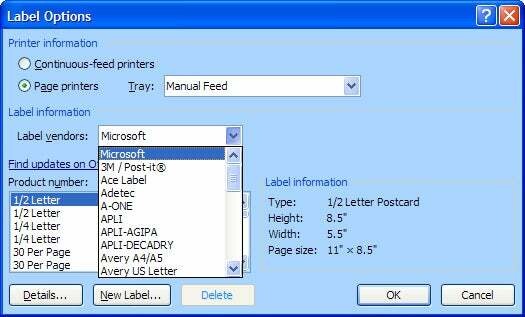 For older versions of Office, you can download free software from Avery and other label manufacturers. Avery has templates for printing business cards, as well as fun projects on its own address and media labels (or on generic brand versions of the same). You'll have to register at the site first. 2. Major CD and DVD burning programs come with label creation programs. Various Nero and Roxio programs include templates and clip art. Avery-owned CD Stomper and MediaFace Online offer some creative options that you won't find in Word.